Of the seven billion people on this planet, two billion use Facebook at least once a month. Each day, Facebook has more than a billion unique visitors. Its groups functionality attracts users with all sorts of niche interests and talents, and its ads platform has some of the most comprehensive targeting options among social media sites. What better place to spread your employer brand and try to source qualified job candidates for your company? The sheer volume of users currently on Facebook means that you’re more or less guaranteed to reach both passive and active job seekers when you’re promoting your employer brand or hiring for any open positions. Anyone whom you might have had a chance of reaching on traditional job boards is likely to be using Facebook regularly anyway, while the 80% of candidates who are not actively job seeking at any given time are also using the platform daily, and could be convinced to switch jobs if they repeatedly encountered your brand and began to think of your business as a top employment destination. The question is: how exactly do you make that happen? Though the recruitment ecosystem on Facebook is complex and ever-evolving, for this particular post we’re going to focus on Facebook ads in particular, and the unique ways in which they can be leveraged into smarter, more efficient recruitment. As we alluded to above, one of the most striking facets of Facebook’s digital ad infrastructure is its targeting capabilities. Advertisers can select the audience they want for each individual ad based on geography, age, and the interests, education, and other information listed on audience members’ profiles. This means that if you’re trying to hire employees for a job at an office in San Jose, you can tell Facebook to show your ad only to those within a 25 mile radius of your office building. On a more granular level, if you’re trying to hire developers who are proficient in C++, you could potentially target users who list C++ or related programming languages as interests. Of course, if you your requirements exclude too many people, your ads won’t perform well, but there is a wide range of audience sizes in which Facebook can get your employer brand in front of your target audience at a relatively efficient price per impression. Of course, this raises the question of how exactly you should go about doing your targeting. As we saw above, some of this process will come down to obvious factors like geography, but as you get more granular in your approach you should consider your employee personas for each open position. What type of background or interests would your ideal job candidate have? What elements of your company’s EVP would line up with his or her Facebook habits? Consider what traits he or she might have, but try not to exclude too many people—your perfect hire might not conform exactly to your expectations. Once you’ve targeted your ad to match your candidate personas, it’s time to think about the composition of the ad itself. For some of you this might seem like it goes without saying, but one of the first things to do is make sure that your ad has a striking, eye-catching image that conveys something about your employer brand and your employer value proposition (EVP). This might be a shot of some employees having fun at a recent corporate event, or something that relates to the kind of work that your company does. Studies have shown that people are more likely to engage with content that has appealing visuals. This means not just selecting the right photo, but ensuring that it’s cropped and sized correctly. While a standard Facebook post image should be around 940 x 788, a sidebar ad image might be more like 1200 x 628. This may seem like it would require a lot of technical work to accomplish, but luckily there are tools that recruitment marketers can use to perfect their images quickly and easily. In some ways the image attached to your ad will be its focal point, but your copy is just as important when it comes to projecting a strong employer brand and enticing candidates to apply for a position at your company. Don’t be afraid of being informal, especially if your workplace is relatively laid back. And definitely don’t be afraid of keeping things brief. One or two sentences with a clear call to action (“apply now,” or a variation on that theme) is all you really need. If you’re advertising for a specific position, make sure to include a link that directs applicants straight to a clear, usable landing page for that position. If your ad is of a more generalized stripe (more on that in just a second), then you can link to your corporate careers page or your Facebook career page (if you have one). In this way, you ensure that applicants don’t drop out of the process because they’re confused about how to apply or what actions to take next. You may have noticed above that we presented both the possibility of advertising for a particular job and posting a more general ad not directed at a specific position. Why would a recruiter pay money to advertise anything other than an open position that needs filling? 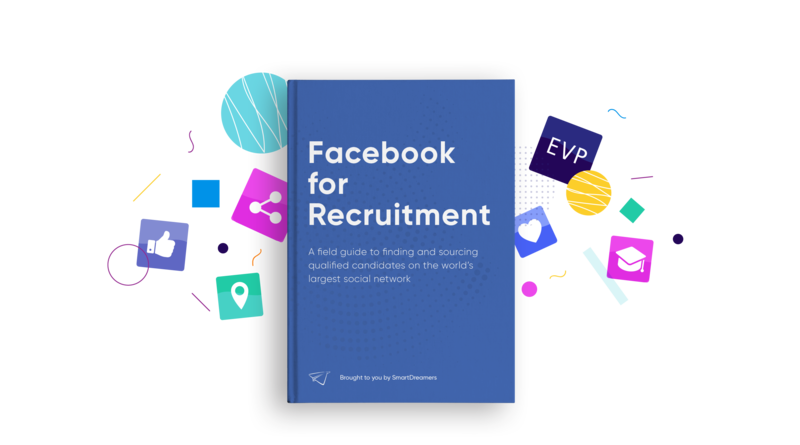 Because Facebook recruitment is most effective when companies leverage their employer brand continuously in order to build a stronger talent pipeline. Thus, while Facebook is a useful platform for filling individual positions, more generalized ads that simply familiarize potential candidates with your employer brand and encourage them to stay in touch (by following your Facebook or other social media page, opting into an e-mail list, or any other means of enticing them into your recruitment funnel) can help you to speed up your recruiting efforts in the long run. Rather than starting from scratch each time you have a new position to fill, by marketing continuously you can drum up steady interest and develop a pre-existing base of interested applicants who will apply as soon as your next opening comes along. As in the case of all things Facebook, the goal of recruitment efforts is engagement. Rather than likes or shares (though, if you’re boosting or promoting posts these are still important), your efforts will be measured in terms of how many users click on your link, and how many of those clicks turn into submitted applications. Even if you’re filling positions relatively quickly, “extra” applications only translate into a stronger talent pipeline. Crucially, it's only by tracking the effects of your employer branding and job advertising that you can uncover potential issues with your recruitment funnel. Are you getting a high number of impressions but relatively few clicks? It may mean that your ads themselves aren’t speaking to your target demographics. Do you have a high number of clicks but a low apply rate? You may need to tweak your applicant experience to keep people from dropping out of your funnel. Whatever the results, it’s crucial to track your efforts over time, so that you can maintain flexible and adaptable in your Facebook recruiting efforts. If you're following all of the other best practices outlined above, Facebook can be a huge asset in your attempts to source qualified applicants and build a strong, winning team.